The president can’t just take his nuclear football and go home. President Obama has a long list of things to talk to Russia’s President Putin about: arms control, missile defense, Syria, Iran, North Korea, energy, oil, and, yes, that pesky leaker, Edward Snowden, who’s blown up the National Security Agency and its superspies. So, wait a second!—he’s maybe not going? Q: Senator Lindsey Graham suggested that the US should boycott the 2014 Olympics if Snowden does get asylum there. What’s the White House view on that? MR. CARNEY: Well, our view is that we’re continuing to work with the Russian government and other nations on this matter. And we hope to see Mr. Snowden returned to the United States. Q: And if he’s not? MR. CARNEY: I’m not going to engage in speculation about that, and the Olympics are a long way off. It’s true that Russia has challenged the United States on a wide range of issues, including Syria. But that’s all the more reason for Obama not to act like a petulant child. The main issue, of course, is not whether or not Snowden gets asylum in Russia. The central topic between the two countries is arms control, which Obama has said will be a chief priority in his second term. The United States also needs Russia’s cooperation on the Syrian civil war, where President Bashar al-Assad is making big gains with the help of Russia, Iran and Hezbollah. He also needs Russia’s support in the upcoming talks with Iran over its nuclear program. And lots more. After a comprehensive review, I’ve determined that we can ensure the security of America and our allies, and maintain a strong and credible strategic deterrent, while reducing our deployed strategic nuclear weapons by up to one-third. And I intend to seek negotiated cuts with Russia to move beyond Cold War nuclear postures. At the same time, we’ll work with our NATO allies to seek bold reductions in U.S. and Russian tactical weapons in Europe. And we can forge a new international framework for peaceful nuclear power, and reject the nuclear weaponization that North Korea and Iran may be seeking. 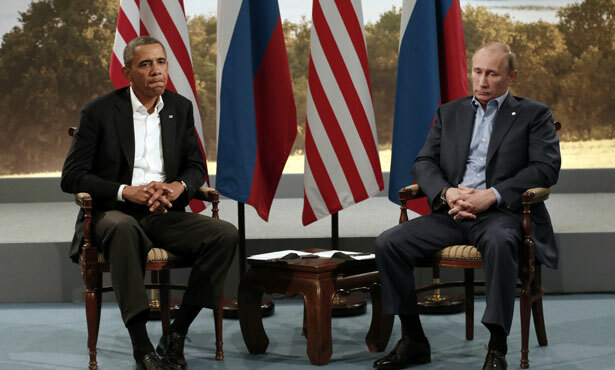 U.S. and Russian leaders need not wait for a follow-on treaty. As they explore options for a new treaty, Obama and Putin should announce parallel, reciprocal reductions to 1,000 or fewer strategic deployed warheads within the next five years, to be verified using the monitoring provisions established by New START. This strategy would help compel Russia to build down rather than build up its strategic nuclear forces. Russia, whose nuclear force already is below the New START limits, is developing a new, heavy intercontinental ballistic missile to match U.S. force levels. More-rapid reductions of U.S. and Russian nuclear forces, which comprise 95 percent of global stockpiles, also would increase pressure on China and other nuclear-armed states to join the nuclear disarmament enterprise, an objective that leaders in Russia and United States say they support. By scaling back its nuclear force to 1,000 deployed strategic warheads, the United States can trim $39 billion from the Defense Department’s costly plan for new strategic submarines, missiles, and bombers over the next decade, according to a 2013 Arms Control Association analysis. The last thing Obama needs is a new cold war with Russia, on top of all the crises that are developing around the globe. Putin isn’t making things easier, of course, by his blatant disregard for human rights at home, including the persecution of Aleksei Navalny. But there are huge issues at stake between Washington and Moscow with life-or-death consequences, and it would be a shame if Obama decides to pick up his nuclear football and go home. Is there any hope for US-Russia peace talks on Syria?